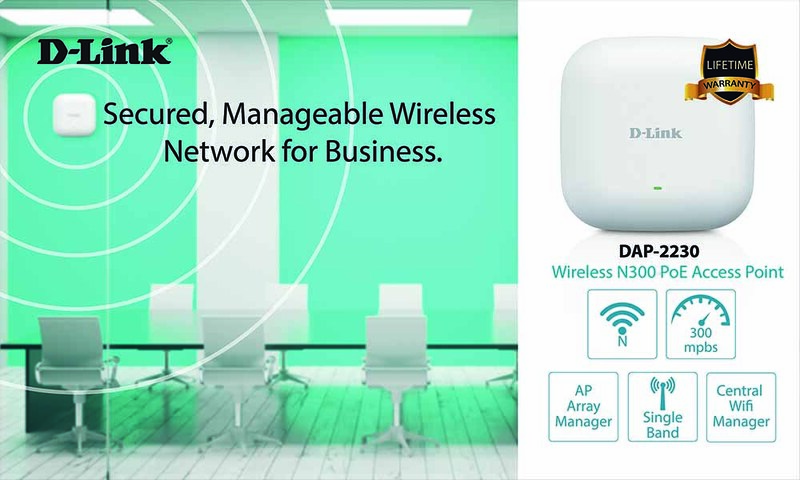 With its strong security and authentication features, the DAP-2230 Wireless N PoE Access Point boasts of MAC address filtering, wireless LAN segmentation, SSID broadcast disable, rogue AP detection, and wireless broadcast scheduling so that you can rest assured that your business wireless network is fully protected. Network Access Protection (NAP) further lets network administrators determine customized levels of network access depending on a client’s specific need, and with a more manageable QoS, network admins have the option to select customized priority rules. The Wi-Fi Multimedia (WMM) Quality of Service (QoS) feature uses the level of interactive streaming to determine which network traffic activity to prioritize, whether the activity is VoIP or streaming HD movies. No longer will your different department teams have to vie for internet access when they’re conferencing—this type of load balancing can limit users per access point, ensuring maximum capacity performance for each dedicated user. It’s time to up the ante with your business network. You can make your office connection a wireless powerhouse with the DAP-2230 Wireless N PoE Access Point at only Php 5,714. Is there any reason to lag behind? Let D-Link help you reach your wireless potential today.